Click here to go to our ebookstore. 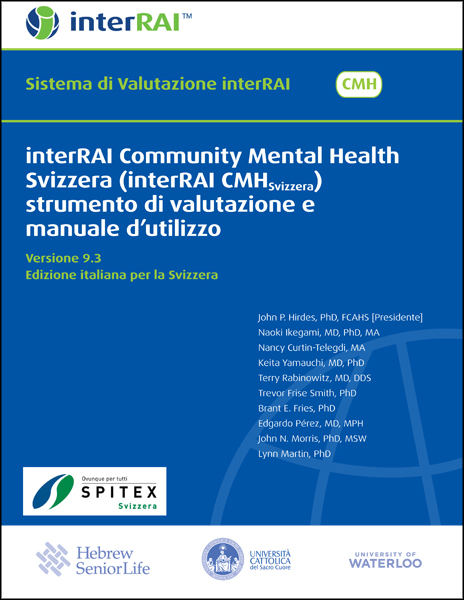 The Swiss Italian edition of "interRAI Community Mental Health Svizzera (interRAI CMHSvizzera) strumento di valutazione e manuale d’utilizzo" is translated from the English "interRAI Community Mental Health (CMH) Assessment Form and User's Manual." This assessment system complements the interRAI Mental Health and Home Care systems. The CMH instrument is designed to be used for community-based individuals with a broad range of mental and physical health needs. The target population is all adults aged 18 and over in community mental health settings, including those with dual diagnoses. This publication contains introductory material, an item-by-item guide to completing the assessment form, and the assessment form itself. The Swiss Italian Edition has been customized for Switzerland, and the Italian language used in this publication is native to Switzerland. Click here for free PDF downloads of Errata Addendum and Correction Notices. All books and publications are printed on demand and sold on a nonreturnable basis. Use of our instruments (forms) is permitted only by written license with interRAI; the purchase of a User’s manual does not provide a use license. For the latest approved editorial updates, please see our Errata page. For questions regarding your order, including special orders and bulk discounts, or discounts on materials to be used for training purposes, visit our discount page, email cservice@interRAI.org, or call 866-595-5055 (in the United States) or +1-978-546-8475 (outside the United States).